Having just walked a precarious tightrope on the other side of this record between the bland pop dross that always threatened to claim the souls of so many vocal groups aspiring for more respectable mainstream success, and the more vibrant rock instincts that had gotten The Ravens this far to begin with, one thing’s for sure, we’ll have no such problems HERE! Whether you fall on the side of those preferring The Ravens to stick to the pure unadulterated rock ‘n’ roll styles of their biggest hits like Write Me A Letter, or if you don’t mind the concessions to mannered pop if it means expanding their audience some, the one thing both parties could agree on was that whichever road they chose at the time The Ravens were always a classy outfit. Though their use of the cavernous bass of Jimmy Ricks out front made them utterly unique they quickly sidestepped any thought it’d be simply a gimmick by letting him handle the songs in a straightforward manner befitting the material. In other words, they were a serious group. What their reasons for stepping so far outside their comfort zone with Rooster, in the process perhaps risking their reputation as a class act, is unknown. 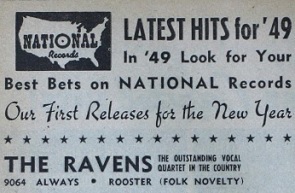 The critics at the time weren’t kind, with Billboard’s review stating emphatically, Believe it or not The Ravens take a fling at a comedy hillbilly work here. Result is dismally unfunny. History hasn’t been any more generous about this ill-suited effort either, with vocal group authority and dedicated historian Marv Goldberg suggesting they hadn’t even bothered to rehearse this by the sound of it (I don’t know WHERE he got that idea because even if you don’t like it you can see it was worked out) and criticizing the entire concept, claiming it’s beaten out as the worst record the group ever released by just one late-career effort when the group, now without Jimmy Ricks, tried covering Buddy Holly & The Crickets “That’ll Be The Day”. Pretty dismal evaluation from all corners wouldn’t you say? So naturally you’d think I’d join in and make my own scathing criticism of the record, chastising them for their poor choice and suggesting we quickly move on, that is if I even bothered reviewing it at all. Obviously with that set-up you know I’ll do no such thing. In fact I’ll defend this and even say I like it. Conditionally “like it” perhaps, but you know what, as silly, stupid, off-the-cuff records go, it’s really not bad at all. In fact it’s quite good. Let’s start with the premise of diversity. The idea that an artist has a style they’re widely known for, a style which has gotten them hits and built their reputation. Yet over time that style can become an albatross, preventing the group from delving into other styles and approaches for fear of alienating their fan base. The Ravens though had TWO styles they were becoming reliant on. 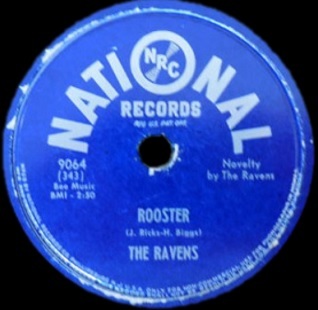 The first and the best of these (not only aesthetically but also commercially to date) was found in their soulful rock sides which had established the prototype for the entire rock vocal group style, bringing an earthy unrefined manner to the masses in ways that hadn’t been widely offered before. Yet at the same time they were increasingly attempting to “cross-over” to the broader pop audience by toning down their lurid style and smoothing over their rougher edges and delivering more acceptable versions of pop standards, hopeful that it’d appeal to those who wouldn’t dare admit they liked their rocking sides. Yet even when this was done reasonably well, such as on Always, it wasn’t ever going to set them apart and define who they were. If those two competing ideals however were locked in a struggle for their hearts and minds – not to mention the record company’s dreams of big sales and exposure – there’s a risk that the wrong side could win out should one of those blander records score big with the public. That’s why if nothing else it was encouraging to hear them cut a song that belonged to neither camp and to do so seemingly because they themselves thought it was funny. Whether you think it’s funny or not, or even if you oppose injecting any type of humor into music made for serious enjoyment (is that a contradiction in terms? ), the mere fact that The Ravens themselves seemed to get a kick out of this skit set to music is all that really matters. Rooster finds Ricks playing a crotchety patriarch on a southern farm who’s less than enamored with his dimwitted offspring, played by the others. All take on good comic drawls that are a long ways from the upper-crust voices heard on September Song or even the more down and dirty tones of Send For Me If You Need Me. If you’re not bothered by the idea of them playing these hayseed characters then the you’d probably admit the performances are quite good. It kicks off with Howard Biggs spry piano followed by actual crowing (by the group themselves I surmise, for I doubt they were willing to pay an actual rooster union scale for his appearance in the studio) and a spoken retort in the manner of Foghorn Leghorn who was a recent and popular addition to the Looney Tunes stable of characters and who’d appeared in his first two cartoon shorts by this time. That section is the most gimmicky we’ll encounter and probably had many ready to give up on the whole thing just seven seconds in. But for those who are slow on the draw when it comes to hitting the off button they’re rewarded for their sluggish reactions when suddenly a very catchy high-pitched circular “whooping” by the others which underpins the entire song starts to build, keeping it moving forward at a steady clip. Thanks to this even during the spoken sections the song just sounds lively and fun. Ricks and Maithe Marshall play the father and one son “Lizzy” respectively with Marshall complaining about the mean rooster they have around to keep an eye on their chickens. I have to admit I find both impersonations entirely convincing. If these two had been used to voice characters IN a Foghorn Leghorn cartoon I certainly wouldn’t have objected, they both nail their parts and prove themselves good actors, albeit in comically stereotypical roles. There’s no self-consciousness to be found here, something which sinks many such attempts by non-comedic performers when they attempt to draw laughs by their mere verbal presentation. Both seem comfortable with the idea from the start, leading me to think that maybe this was even something they worked up on the road to make each other laugh in the car on the long rides between tour stops. Their immersion in these characters is evident throughout and as a result, even if the written lines fall a little flat as it goes on and becomes more centered on humor than music (though they keep it authentic by mixing in a banjo alongside the piano), the conviction in their voices sell it enough to work. Naturally being a Ravens song there is going to be more traditional singing to be found somewhere, and there is… sort of. I mean, they DO sing, Ricks takes his usual lead role, yet he never sings AS Jimmy Ricks, the deep-voiced Lothario whose voice may very well be the most compelling and distinctive in all of rock ‘n’ roll at this point. Instead he stays in character, singing like the put-upon country farmer who just wants some peace and quiet away from his pestering family and who apparently has a greater affinity for the bird than his stupid kids. He intersperses half-spoken descriptions in the midst of his singing lines to further the “plot” so to speak, but really none of this is about what actually happens as much as it is how they happen to present it all, tongue in cheek, trying hard not to break character, but smiling throughout it all. Maybe they’re only amusing themselves but as long they’re having fun why begrudge them their goofing off on record? Is this the song that you’d want The Ravens reputation to rest on? Hardly. Is it something that would advance their careers, broaden their audience, or start a new trend? Of course not. Is it even something that you’d want to play often, even in the privacy of your own room with no one around to cast judgment on you for listening to such a thing? Probably not. But is a silly song about a Rooster something that CAN be enjoyed once in awhile and even be APPRECIATED, if only for allowing a group who have already made such a notable impact in rock to let off some steam, have a little harmless fun and show that they were more than just the (dual) images they’d been presented as? So while you might not laugh out loud at the results and think the whole idea is beneath them – or beneath you – the fact is they didn’t think it was beneath them and that means a lot more. Go ‘wan and crack a smile at least, it won’t break your face. On the one hand, this record sounds pretty substandard to me. On the other hand, this thing pretty much establishes the Coasters’ shtick (one of my favorite rock groups ever). Imma give this one a two. I can’t get with this, but I do appreciate it to some degree. Leave a reply on "The Ravens: “Rooster”"